Figure 1-20. - Film and cylinder placement: mandibular bicuspid area. using anatomical landmarks on the patient's face. Tell your patient to maintain the position of the placement of the dental film and not to move while you expose the radiograph. 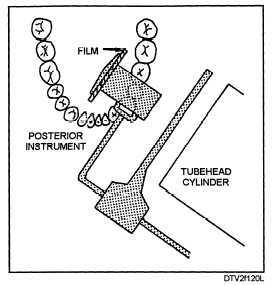 - This is the up-and-down positioning of the tube head. A 0° vertical angulation indicates that the tube head is positioned with the cylinder parallel with the floor (fig. 1-26). Angling the tube head so the cylinder points upward from 0° will give you a minus () degree of vertical angulation. Angling the tube head so the cylinder points downward from 0° will give you a plus (+) degree of vertical angulation. Different areas of the mouth require different degrees of vertical angulation. The correct vertical angulation can usually be obtained by using the angles shown on the chart in figure 1-26. Notice the tube head is angled downward for maxillary radiographs, and usually angled upward for mandibular radiographs. 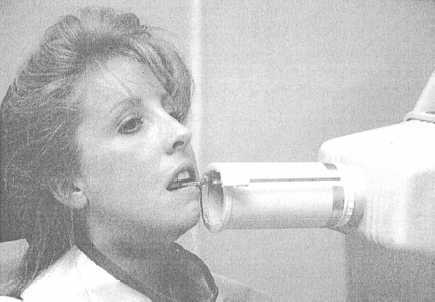 The tube head may be horizontal (0°) when X-raying mandibular molars. A wrong angulation results in a distorted radiograph. Too little vertical angulation elongates the radiographic image (fig. 1-27); too much vertical angulation foreshortens the image (fig. 1-28).